It’s been a long time since there have been any updates about the insane Apollo Intensa Emozione hypercar, the successor to the Gumpert Apollo. It’s been over two years since the prototype was unveiled, but the Apollo IE is now finally ready for production – and there have been a lot of changes since the prototype’s premiere. Apollo has partnered with Motorsport specialists HWA AG, which has developed an all-new chassis for the Apollo IE replacing the old prototype’s chassis. It’s said to be the first all-carbon fiber production chassis of its kind, consisting not only of the monocoque but subframes and crash structures. The new chassis has also been engineered to "meet and to partly exceed respective FIA LMP2 safety requirements”, so there’s a chance we could see the Apollo IE race in the new Le Mans hypercar class. A carbon mono-cell provides occupant protection without the requirement for a roll-cage. Key features of the new chassis include a modular design, increased safety, increased torsional rigidity, symmetrical design (offered in both left and right-right-hand configurations) and weight reduction compared to the prototype platform. The new chasiss has been co-developed with Apollo, HWA AG and Capricorn Group. Capricorn already has experience producing world-class chassis’s such as the Le Mans-winning Porsche 919 LMP1 monocoque. Since the hypercar is road legal, Apollo has also made several safety improvements, including redesigned door internals that increase safety in side impacts, a door hinge safety system that disengages the doors in a rollover, and even a built-in fire extinguisher for the first time in a road car. Compared to the prototype, the production car is much more aerodynamically efficient to improve performance and stability. Improvements in cooling have also been made throughout the engine bay and braking system. Thanks to extensive dyno tests, engine performance and gearbox refinement have been further optimized. Powering this insane car is a naturally aspirated 6.3-liter V12 engine that revs up to 9,000 rpm and produces a substantial 780 horsepower and 560 lb-ft of torque. This allows the hypercar to hit 0-62 mph in just 2.7 seconds before topping out at 207 mph. All that power is sent through a six-speed sequential gearbox with fully interchangeable gear ratios. 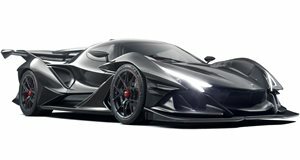 The Apollo IE tips the scales at 2,755 pounds with a 45:55 front/rear weight distribution and produces 2,976 pounds of downforce at 186 mph, so it should be capable of setting some blistering lap times. Inside, the final production IE features an all-new interior with a sport or race-seating system and the ability to changes the configuration, but we won't see the new interior until the first production car is delivered. Production of the Apollo IE will take place at the same factory where HWA AG built the legendary Mercedes CLK GTR endurance racer, with customer deliveries starting this summer.